Welcome to the spiritual life, my friend. Every film operates on at least two levels all or most of the time: the physical world and the spiritual world. Few films, however, are as intensely aware of operating on both levels, and do it so consistently throughout their narrative--and take great pains to communicate to its audience that it is doing so--as John Wick Chapter 2. Why is this important? Because it validates there is a message within the film, and validates our effort of engagement to decode what that message is. In this particular poster, for example, all guns are pointed at Wick's head; why? The head symbolizes our "governing function," such as the "head of government," and the head is the most important part of the body. 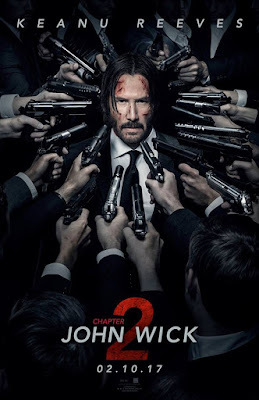 The guns point to Wick's head because Wick has been able to "govern himself," as Abram says in the opening sequence regarding Wick's focus, commitment and sheer will power, and those virtues means the forces of evil can't overcome Wick because Wick has fortressed himself with those virtues. 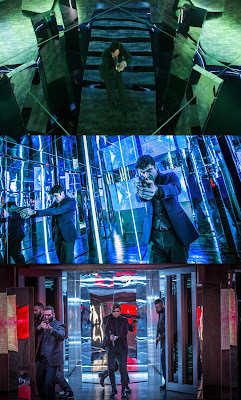 On the spiritual level, all demons (the assassins) want to kill John Wick because there is a $7 million dollar reward for him; "7 million" is divided into two different symbolic numbers: there is the "7" and there is the "million." Seven always symbolizes perfection, or, in opposite terms, total depravity. Since John Wick survives to the end of the film, instead of dying, and because he is the hero, then the $7 million contract Santino puts out on John Wick means that Santino recognizes John Wick as "perfection" and it will take "perfection" from the demons to destroy John Wick. The assassins, of course, are not literal demons, they are, however, metaphorical demons, or "tools" used by Satan to break down John Wick so the devil can collect Wick's soul (it's okay, all this is explained below). So, what does the "million" represent? Any multiple of "10" is divine perfection, it means the work of God has been brought to completion. By the end of the film, there is a $14 million contract on Wick, which means God has opened another work he He is going to bring to completion (Chapter 3). It takes me a while to get to this in the body of the post, but, as you read, note that John Wick makes two important mistakes at the start of the film: he doesn't kill Abram (the uncle of the kid who stole Wick's car in JW, and then Wick buries his clothes, coins and guns in the basement again (more on that below). Why? In case Wick needs them again, and that's "an open door policy," in other words, a part of Wick is ready to go back to the life, although he would rather not. On the other hand, Wick is very, very far from being perfect. Why does Winston call Wick, "Jonathan?" Because Jonathan (1 Samuel) was the name of the first king of Israel, Saul, who didn't finish God's Holy War against God's enemies, and so Saul was rejected. When Wick has killed Santino (which means "Little Saint") in the Continental, and Winston asks, "What have you done?" Wick replies, "Finished it," because that is exactly what Wick had to do (and what Wick didn't do with Abram at the start of the film). Winston doesn't want Wick to be the "son of a reject" who didn't finish what he was set out to do, so Winston calls Wick "Jonathan" to remind him that shame constantly lurks if Wick doesn't do the absolutely perfect thing. There is significant word play in this phrase, because it's a sentence, as in, a punishment, but the "sentence" is a form of communication which has now been outlawed with that person who has so been sentenced. Please note, every spoiler is contained in this post, and you do not want to know the spoilers before seeing John Wick Chapter 2, so please, for yourself, see the film first, then read the post, then go see the film again,... and again,.... because no matter how many times any of us see it, we will pick up something new we didn't catch the last time, it's that good. This post builds upon John Wick, which you can read here at Specialized Waste Disposal John Wick). (Please click on this, or any of the other images below to enlarge). It's imperative to the understanding of the film that we notice that the art exhibit in the museum towards the end, the place of the final battle, is called Reflections On the Soul. The exhibit is all glass and lights; why? Because glass symbolizes "reflection" (our ability to meditate on our actions and interior life) and light symbolizes inspiration and wisdom (knowledge which we attain but could not be obtained on our own merits or understanding). What we see in this climatic scene then, is the not-so-subtle translation of spiritual warfare within our souls: we have to "kill them, kill them all" as Wick says at the end of the film; who are we killing? Those forces of evil who lurk in our souls, like the assassins lurking in the exhibit. Reflection and light are there to both help us, but also there to wound us: unless we understand how reflection/meditation can go bad (not seeing ourselves correctly, but exaggerating our traits, for example) and how we can be mislead by light rather than led by light (for example, thinking God has inspired us to do something when it was actually coming from the devil) then we can become trapped and lose the battle. EVERYTHING IN THE FILM IS AN EXTENSION OF THIS ART EXHIBIT, which is why we hear the computerized female narrator at the museum twice saying, Welcome to the Reflections On the Soul. What exactly does Wick prove/learn from this experience? That each of the assassins hunting him is a part of him, that's the purpose of the mirrors, so that as Wick sees the assassins, he's seeing himself and the man he used to be, but is trying not to be anymore. John Wick (just like the rest of us) continually has to undergo a process of "conversion," the recognition that, "I haven't come far enough, there is still so far to go, and if I don't go further, I'm going to start falling behind." The spiritual life is an active life, it's not a life about "retirement" (which is what everyone wants John Wick to do), rather, if we are not fighting the spiritual battle, we are losing the spiritual battle. On a slightly different note, apart from Wick himself, the most important character in the film is Winston; why? It's not that Winston is a "God figure," rather, it's through Winston that we learn the grand scheme of what's going on, we get, in other words, a "God's Eye perspective." For example, when Winston collects Wick's payment confirmation from Santino for Wick's marker, Winston tells Santino how Wick had a glimpse of what was on the other side of the assassin's life, and Santino took it away from Wick. This is true, but it's not also entirely true. God always works in "pairs," the first which is presented to us by God is good, but the second which God presents is far better (I could provide examples, but I'm not going to digress more). Wick's life with Helen was the "good" which Jesus Christ tempted Wick, but Jesus will offer Wick something even better after Wick fulfills these trials, so yes, Santino took it away from Wick (when Wick asked Santino not to collect his marker--more on this below) but God allowed Santino to do it. Remember, Jesus (and we see both the cross tattooed on Wick's back, and the mural on the soup kitchen wall at the Bowery King's that says, "Jesus Saves," so this is a relevant point) Jesus Christ is a "fisher of men," and like any fisherman going to catch fish, Jesus uses bait, and the bait to hook Wick was Helen. Wick "got out"of the assassins' lifestyle, but Wick left an "open door" to go back by giving that marker to Santino and Wick promising he would help Santino do something in exchange. God knew all this was happening, and so Helen dying was God's punishment on Wick for not trusting in God to get Wick out of the assassins' life where Wick was when God called Wick to conversion and instead Wick relying on Santino. On a very different note, the lights, mirrors and art in this exhibit validate the encoding mechanisms being used throughout the film: there aren't any actual souls on display in the exhibit, but the light and mirrors are metaphors to discovering the soul within us, "images of self," as the female narrator puts it in the film as characters enter the exhibit; likewise, different elements of the film will also provide means by which we can reflect upon our souls through the journey of John Wick. Most people are going to assume that the status of ex communicado is the same as ex communication, and deduce it means "to be cut off from or put out of the community," and that John Wick is no longer a member of the assassin's guild, league, union, or whatever structured organization it is, but that phrase describing that state is ex communicare; ex communicado is, however, more severe, for at least two reasons. (Please click on this, or any of the other images, to enlarge). When Wick makes it to his car, the gestures Wick uses, the way he walks and "gets by" the thugs standing guard, is echoed in Rome after Wick finished with Gianna and Wick gets back to the Catacombs where his escape route is; why? 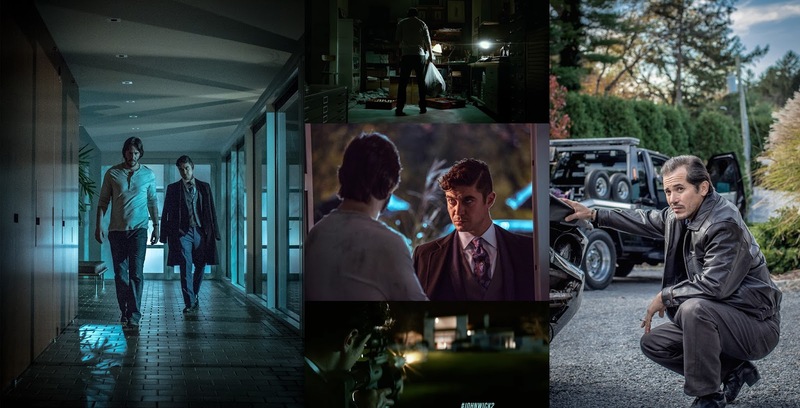 As I explain below, because Wick didn't do what he was supposed to do in getting his car back with Abram, Wick now has to endure the far greater trial of killing Gianna, and by mirroring these two scenes, the film makers want us to keep that in mind. When Wick finds his car, covered with the tarp (lower left image) it's like a body bag covering it; why? Because Wick is dead like a cadaver covered with a body bag in the morgue (don't believe me? Remember when Wick wakes up after telling Earl to take him to see the Bowery King, and the guys Earl killed are in bags beside Wick, but Wick is alive and bandaged; again, that scene is being played out because Wick fails to kill Abram, so Wick has to go through it all again with Santino). There are a few important visual elements we have in this opening fight sequence which we must note. First, the assassins working for Abram drive taxis, as we see in the lower-right image. Wick owns the Mustang he retrieves, it's his car, but a taxi--like a hotel room--is a temporary vehicle you don't own, you just use. This is one indication that the assassins working for Abram, and hence, working against John Wick, are demons: the world evil builds here on earth is temporary, whereas the world of the Christian, the world of the spiritual warrior, is being built in the next world, where there is eternal permanence. Please remember this point as we discuss Gianna and Santino below, because they have built up a world of temporary power at the expense of their immortal souls (remember, it's Gianna who asks Wick if he's afraid of "damnation," and Wick replies, "Yes"). In this warehouse fight scene, the numerous windows signal "reflection" and meditation, that is, not just Wick's own meditation upon what he's doing, but for us, the audience, to reflect on what is truly happening in the narrative as well. Then, there is all the water we see, especially on the floor where the character's feet are in the water (again, lower-right image, we can see the assassin and Wick, as well as the yellow taxis reflecting in the ground water). When Abram tells his right hand man about John Wick, and describes how awesome Wick is, Abram uses the description about Wick's "focus, commitment and sheer will" to achieve whatever it is Wick sets himself out upon to accomplish, and these are the same virtues required of the spiritual life. So, if we fail to engage with the opening scene, we aren't going to be capable of engaging with the rest of the film. When the film first opens, we look at the city from numerous angles; we then see what looks to be like an old, silent film playing on the side of one of the buildings, with noise added for the crashing effects, but then we realize that the sound is "off" and the noises aren't aligning with the action sequences,.... then we see the real car chase taking place. What's the point of that silent film moment? That's a proper introduction to how to watch the film: part of the film is going to be "off," or not make sense, unless we realize that we are seeing one thing (like the silent film on the building) and hearing something different (the real car chase taking place). This was a favorite device of Alfred Hitchcock's in some of his mid-career films, such as North By Northwest and Torn Curtain: we are watching one show, like in the art auction in North By Northwest, but the "real drama" is taking place with what is happening to Cary Grant's character. So, in JWC2, what the "sub-text" denoting the real drama taking place? First, it's the religious meaning: people are far more willing to "take in" a religious sermon if they don't realize they are taking in a religious sermon. Wick's journey in the film is about the spiritual warfare in which his soul is engaged, yet there is also the additional political commentary we can find, specifically regarding Gianna's coronation and murder by her brother (which we discuss below). Now, we see a car hit the motorcyclist, and a pair of men's feet, in black shoes, socks and pants, get out and walk to the downed cyclist and take out an entry card. Why is this the first image we see of John Wick? Feet, as we know, symbolize the will, because our feet take us to where we want to go the way our will drives us towards what it is we want in life. We also know that the color black signifies death: there is good death and bad death. Good death is being dead to things of the world, to our appetites and worldly ambitions, but alive in faith, hope and charity. Bad death is when we are dead in our souls to faith, hope and charity, but we are alive to our worldly ambitions and appetites. We know John Wick is trying to "get out" of the assassin life where he was the best of the best, so John being "alive" to his worldly appetites isn't a fitting interpretation. Because of what we do see Wick do, it makes better sense that Wick is alive to the spiritual life, and it's because he is alive to the spiritual life that the demons trying to take down his soul attack him. It's fitting that we see Wick's feet first because Wick's car, like his feet, symbolizes (somewhat) his will: any vehicle in any time period will symbolize the Holy Spirit "energizing" you to follow your path in life. In other words, we become the vehicle for the Holy Spirit, so when those thugs steal Wick's car in John Wick, what has symbolically happened is that they have stolen the Holy Spirit's ride. Wick's wife has died, and so Wick is ripe for a spiritual battle because he's down, and the demons come to collect. The Holy Spirit has a different plan, because Helen was never the Holy Spirit's final reward for Wick, rather, Helen was just the bait (we discuss this further below, too). Did you notice, dear reader how, when Wick drives the car that Wick looks too big for the car? Or, rather, the car looks too small for Wick? That is an incredible detail that all ready tells us what is going to happen: because John Wick has so successfully won the war being waged against him, the Holy Spirit all ready has the next battle prepared because John Wick has "grown" so much during the events we have seen heretofore, so the Holy Spirit can make John Wick an even better man, even as Wick has all ready decided he will establish peace with Abram (more on this in this same caption, but a bit below). THIS IS REALLY, REALLY IMPORTANT: how do we know that the assassins in the film are "demons" and not just assassins? There are two ways: first, the way the assassins themselves are presented, and secondly, because the art exhibit towards the end is called Reflections On the Soul, and it's upon the soul that demons wage war. First of all, the motorcyclist Wick crashes into in the opening sequence has no face: he wears a helmet, covering his identity, and the curse of demons is that, because they were enslaved to their appetites, they lost their identity, as opposed to angels who, because of their love for God being greater than love of self, they enhanced their identity even more so they became even more differentiated from one another, thereby, gaining a greater sense of dignity and individuality (this is important for the very last scene of the film, so please keep this on your back burner). But not all the assassins are faceless, you object, and you are right in pointing that out; however, art--in all of its forms, especially in film--economizes quite well, which means that the symbolic nature of a character need be established only once, and that is done throughout John Wick and at the start and ending of John Wick Chapter 2. Remember in John Wick what the tagline was? "That nobody!?" "That 'nobody' was John Wick." "Nobody" refers to somebody with no identity; "John Wick" refers to someone with a singular identity. Do you remember the names of the Russians who stole Wick's car in the first film? No, no one does, but do you remember the name "John Wick?" Of course you do. In still more other words, the demons in the first film (the ones without a memorable identity) have now becomes demons with no identity because the demons are more severe and difficult to overcome (we'll discuss this below with Wick's house blowing up). As stated above, the devil has robbed Wick of his direction in life (cars and other vehicles are to us what horses were in Biblical and Medieval times when they were also metaphors of the Holy Spirit because the Spirit carries us through life, and provides us with the path we are to take) so when Wick walks into Abram's office and drinks a peace offering with him, Wick "makes peace with his demons" and that is a mistake for which Wick pays throughout the entire film. How do we know? There are at least two ways: first, because of what the name "Abram" means, and secondly, because Santino accuses Wick of thinking Wick is "Old Testament" towards the end of the film, right before Wick blows Santino's forehead off. First, "Abram refers to the Biblical patriarch Abraham before God called him "Abraham." So, "Abram" means "high father," not because the character Abram himself is a "high father," but because that is what Wick would have earned for himself had he vanquished the one who contributed to stealing his car, in other words, by completing the "holy war" in which Wick had to engage to once again get his car/direction in life back, Wick would have "assumed" being the "high father" for himself (so the exact opposite of being assumed to the "High Table" like what Santino wants for himself). This is a tricky metaphor to offer, but at least on a shallow level, think of spiritual warfare like this: just as in a video game, the "hero" will get points when the hero vanquishes different degrees of enemies, so, too, in the spiritual life, when we vanquish temptations and demons trying to kill us, we gain strength and resources we can use in future battles against even more difficult demons and temptations; it's not that life and spiritual warfare mimic video games, rather, video games mimic and codify the spiritual life and the battles of the soul. Because Wick failed to vanquish Abram, he is like King Saul of the Old Testament who failed to vanquish the enemies of God in holy way which is why, as we shall see, that Winston calls Wick "Jonathan," because Jonathan was the son of Saul, the king who was rejected by God. All of this has been so perfectly intertwined, if you don't understand something, I assure you, dear, good reader, it's my fault for not being as smart as the film and failing to properly communicate. First, it's through his ability to communicate with people that helped John Wick get through the ordeals we as the audience witness in JWC2. Everyone in this line of work knows everything immediately, from their cell phones regularly giving them updates, to the good old stand-by carrier pigeon and the homeless security system of corner beggars. Communication is knowledge and knowledge is its own form of currency in this world (whether it's his friend calling to find out where Wick's car is, or the Bowery King knowing that Santino is at the museum, communication is key to survival). Yea, bad day. Okay, so what is happening between John Wick and John Wick Chapter 2? Opening John Wick, Wick buries his wife, Helen (there is more on Helen below) and then he loses his car; JWC2, Wick gets his car back, then loses his house; why? We saw in The Conjuring II: the Enfield Poltergeist how the demons attacked the Hodgson family in London after the father and husband, Mr. Hodgson, left for another woman; Ed Warren explains to Mrs Hodgson that demons like to get us when we are down because the misery we feel makes it easier to distance us from God because our faith is wavering and we are all ready taking it upon ourselves to distance us from God because we have lost faith because God allowed something so bad to happen to us. In other words, we help the demons drag ourselves into hell willingly. That is exactly what happens in JW and JWC2 (please see Valak: The Conjuring 2 & the Demonizing Of White Men for more). The visualization of this image is perfection: remember, later in the film, when the Bowery King escorts Wick to the elevator and tells Wick that his "descent into hell begins here,"? That line echoes what happens right here, with Wick's house getting blown up during the night. It's night, and "night" symbolizes the Dark Night of the Soul when the soul journeys to union with God. REMEMBER, dear and gracious reader, that the art exhibit is called Reflections On the Soul, Gianna asks Wick if Wick is afraid of damnation (as she has committed suicide) and Wick responds, "Yes." This image of Wick's house burning down is the image of what a soul in hell looks like, and then there is also the mural we see in the soup kitchen when Wick is with the Bowery King that says, "Jesus Saves" on it, so this reading is not "out of line" with the narrative, rather, because of the silent film we see at the very beginning, the film encourages us to look for the "sub-text" within itself to understand the real drama taking place. Regarding this scene, we can rely upon the poetry of St John of the Cross to "ferry us" like Charon does with Wick at the end when Charon takes Wick to see Winston in the park. "In an obscure night/Fevered with love's anxiety/(O hapless, happy plight! )/I went, none seeing me/Forth from my house/where all things quiet be." You probably see a number of problems with lining up this poem to the events taking place in the image above, but we just need to talk through it. First of all, Wick's soul is indeed in a state of "obscurity" because of his retirement and no one thinking he's back (consider Jimmy the police officer asking Wick about him being "back") and "night" we can be sure of because the film makers have Santino enter the house when it's still light outside (please see the images below) but Wick's house explodes when it's night. There are two parts to the next line: "fevered" and "love's anxiety," because "love's anxiety" refers to what Wick will do without Helen filling his life, and the "fevered" refers to the sickness God allows to come over Wick so Wick will be led away from his temporal dependence upon Helen and her memory, and to God Himself (yea, we discuss this more with Helen below when Wick sits in the burned down house and he has the bracelet he had given her). The "happy plight" refers to the difficult situation souls discover: if they don't leave the house in which they are, they are bound to stay in the house and never achieve their union with God; if they want the union with God, they have to leave the house, and so it's a "happy plight," like the Children of Israel leaving Egypt and wandering the Wilderness for 40 years, because without that hardship, a greater reward and advantage could not be achieved. When Wick goes out, "none seeing me," we can argue that Jimmy the policeman sees Wick leaving the house, and of course, the Pit Bull is with him; but none see John Wick as God sees John Wick, what John Wick still has to become in order to fulfill himself. Wick goes "forth from my house" because hell still grows and lingers within Wick's soul. When John of the Cross writes, "where all things quiet be," we might think, yea, there is no way this relates to John Wick, look at the explosion of his house, right? Wrong. Before Santino arrives, it is all quiet: the car guy comes by and picks up the Mustang, Wick plays with the dog on the lawn and a tennis ball,... all is quiet as Wick's retirement (?) is going to be honored,... but it's not. There is a second condition to this "all is quiet" perception, namely, the rule of thumb in the spiritual life: if "all is quiet" it means one of two things: God provides the soul with a temporary respite to rest before the next battle, or the person has ceased fighting their demons and the demons win because they are allowed to make small, but steady gains over the soul that refuses to defend itself against them. When Wick makes peace with Abram, Wick quits before finishing the job and allows the rest of the demons to linger (which means we might see Abram later in the series). Santino later argues with Winston when Winston comes to collect Wick's marker that "Wick was all ready back in" the assassin's life, and, as we discuss below, this was only partially true. 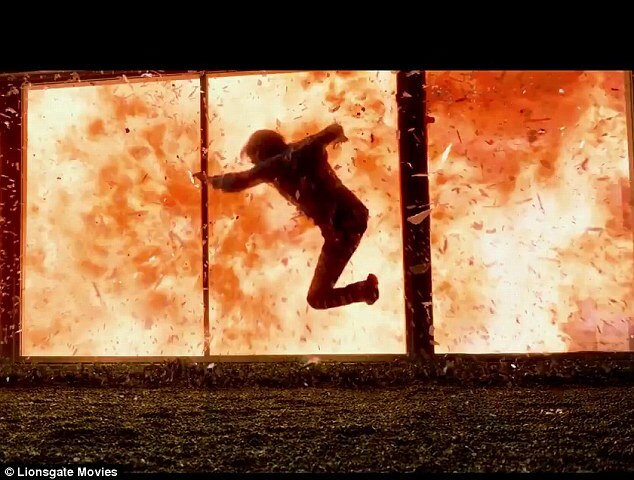 Wick's house exploding is the most important visual in the film; why? Because it links to the most important dialogue in the film: Gianna: "Are you afraid of damnation?" Wick: "Yes." For a man who doesn't waste words, his quick response was the most surprising piece of information we have learned about Mr. Wick (there will be more on this below in the caption where we discuss Gianna's death). When we see Wick's house burning, that's a sign that Wick is damned: the massive fire rolling throughout the house, all the intense heat and the glass shattered everywhere, Wick is a man who is damned,... but he can still redeem himself. In John Wick, it wasn't that Wick lost his car and puppy, it's that he learned how demons would use him to destroy Wick's own life (stealing the car was using Wick himself to wreck havoc on the world, instead of Wick fighting his own spiritual battle, which is what he did). In Chapter 2, Wick doesn't lose his house, he realizes that his worst fear is coming true, namely, that because of all his sins, he is a damned man, and he has to save himself. Please, do not underestimate the importance of Wick telling Gianna that he's afraid of damnation, because that's the key to the whole trilogy, and why Wick has the tattoos on his back that he does. We don't spend much time at John Wick's house in either film, and since Winston calls it the "temple" of the priest when collecting Wick's marker, the three events taking place here are significant. First, Aurelio, the car guy who is friends with Wick and helped Wick locate the Mustang, details for the audience everything wrong with Wick's car: "And I don't know if you noticed, but there's a crack in your windshield," because the crack in the car windshield signifies that Wick can't properly see where the Holy Spirit wants to lead him (the windshield is glass, so it symbolizes reflection, and the car is Wick's vehicle, as Wick is meat to be the vehicle of the Holy Spirit); this isn't Wick's fault, it's human nature. We tend to resist the incredible journey of transformation God demands of us all, and the validation for this interpretation is when Aurelio says, "I can fix it. It'll be ready by Christmas,... 2030." Christmas, is of course, the birth of Christ, and the arrival of New Life and the Messiah; that Aurelio links the restoration of Wick's car to Christmas means that Wick himself should be fine by Christmas 2030, indicating the long process in his journey which Wick is to undergo. But more on that in a moment. The last detail of this scene is when Aurelio laments, "John, I thought you loved this car!" and then details the damage; why is this important? Because even though Wick loves his car (and was willing to go to extreme lengths to get it back) so, too, does the Holy Spirit love us and yet, is just as willing to allow us to suffer damage as Wick did to his car; but that is the case in point, isn't it? It was Wick who wrecked his car, not someone else, just as it's the Holy Spirit who will wreck us, not the devil. In other words, when we suffer, it's at the Hands of God, not of Satan, and it's because we are loved, but also because we need to be fixed. The second important act Wick makes at his home is "burying" the hit man within him,... again." We didn't see the "first burial" in John Wick, but we see Wick uncovering the chest with the weapons and gold coins. Here, at the start of Chapter 2, we see Wick bury everything once more, and it does certainly look like a lonely funeral: coffin, cement and all. So what's the problem? It's still there. It's all still there for Wick if he needs, or wants, to use it again. It's like a smoker who keeps a pack around "just in case," arguing with their self they aren't going to smoke it, but it's there, "just in case." In this way, Santino was right: Wick will "always be that guy" as long as he has his gear around. Of course, we see how deeply invested Wick is in the life when, after the house blows up, he goes to the specialized bank run by the Hasidic Jews only to reveal he has another stash of hit man gear. So, how many stashes does John Wick have? You can't "get out" and expect that to be respected unless you are all out. Why am I arguing this point? Because it is, in fact, the whole point. John Wick never changed. He never really left "the life," but now, really is his chance to get out, once and for all. In the image above, we see the third important event that happens at Wick's house: Santino's visit, of course. The walk down the hallway is a hallway filled with glass: because hallways "connect" different parts of a house, they are used as symbols for bridges, and the connections of different parts of our lives. This is the part, basically, where John Wick and John Wick Chapter 2 get connected, but it's also how these parts of Wick's life get connected. It's imperative to know that "Santino" means "Little Saint," and that's because, after Wick buries the guns, clothes and gold coins, the "little saint" comes knocking on his door: Revelation 3-20, "Those I love, I rebuke and discipline. Therefore, be earnest and repent. Behold, I stand at the door knock. If anyone hears my voice and opens the door, I will come in and dine with him, and him with me. To the one who is victorious, I will grant the right to sit with me on my throne, just as I overcame and sat with my Father on His throne." Santino. as we know, isn't a "little saint," and that's important for his character and the film: Santino was called to be a saint (we all are), but instead of choosing the ways of heaven, Santino chose the ways of the world, preferring a seat at the High Table instead of the Table of the Lord, so Santino orders his sister murdered. How is any of this holy? Gianna and Santino are both rotten apples, and they would have been horrific forces loosened upon the world if someone didn't stop them (and we will go into this more below with Gianna's death). Wick is the only one who is capable of stopping them, but there was no real reason for Wick to come back, unless God allowed Santino's ruthless and wretched sins to twist him so badly, that Santino wanted power more than he feared for his life from a vengeful John Wick. Just as we see Winston "protecting" Wick at the very end (Wick asks Winston why Wick is still alive and Winston replies, because I've allowed it, and then everyone in the park stops and looks at Wick, so Wick knows Winston's power) God has protected Wick throughout because Wick is doing God's work: ridding the world of Santino and Gianna. The events God allows Wick to endure are both in penance for Wick's sins and to make Wick a better man, as we shall continue exploring below. 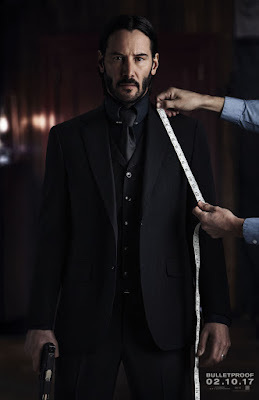 John Wick's clothes are really important to him; how do we know this? We see him bury clothes, throw clothes away, and have specially tailored suits made. So, what does John Wick wear in this scene? The wedding garment. 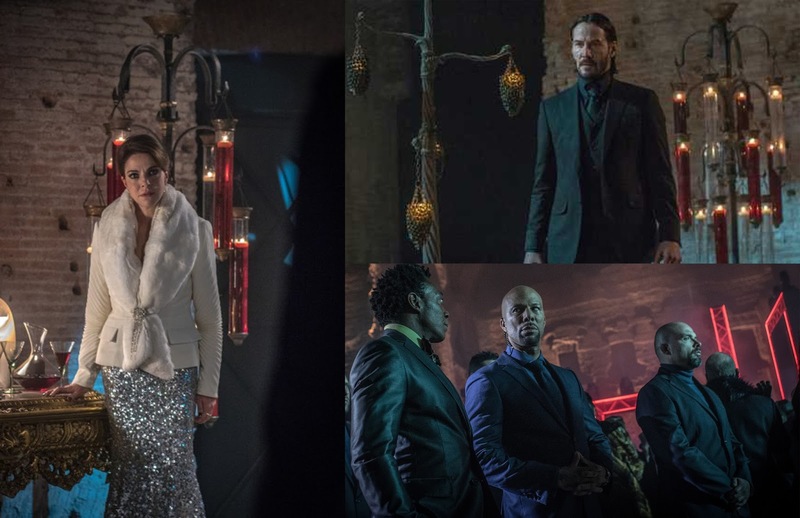 The all-black ensemble may look more like an undertaker's suit than a wedding garment, but in the case of John Wick, it's both. 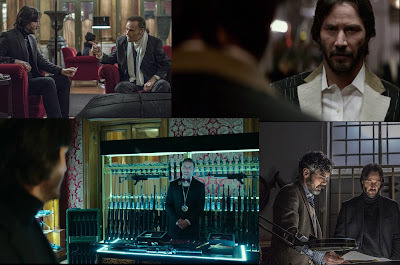 We see in the second act of the film, when Wick is at home in his basement and he buries his clothes, guns and gold coins, that it's like a funeral, but when Wick puts on these clothes, it's his own funeral, because what he does, he does not as his own will, but ultimately, as God's will, because God knows Wick won't stop at killing Gianna, God knows Wick will kill both of them, and that--in this context--is what the film makers want to communicate to us: Gianna, as a symbol of feminism and power in the hands of women, is just as ruthless as Santino and his power-grab for New York, which is going to displace everyone and cause horrible consequences (more on this below with Gianna's death). 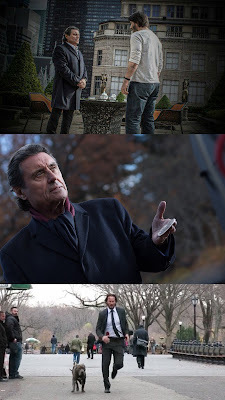 When Wick "agrees" to kill Gianna, Wick also agrees to kill Santino, and that's the way it has to be done, which is why Santino has his own hit men go to kill Wick after Wick kills Gianna, because Santino knows Wick will come after him next, as Winston spells out for him when Winston goes to collect Wick's marker. The wedding garment of the soul: why is it all black? Black always symbolizes death, but there is "good death" and there is "bad death." "Good death" is when we are dead to things of this world, such as lust, drugs, power, wealth, etc., and instead alive to things of the next world, such as faith, hope, purity, charity, love and faith. "Bad death" is when we are dead to things of the next world (we are dead in faith, and dead in love) but we are alive to the things of this world (we seek power and wealth, for example). We know Wick isn't killing Gianna and Santino for his own sake, he didn't want anything to do with it and asked Santino not to call Wick's marker up for him to kill Gianna, but Santino did anyway. So, Wick is the undertaker for his own funeral, in that, it's not enough, as discussed above, to just bury his guns and gold coins beneath a cement slab--it's too easy for Wick to resurrect them--but Wick has to put to death that which is in him to no longer see it as possible to go back to this life, and at the end of Chapter 2, when Wick tells Winston that Wick will kill whoever comes for him, there is blood around the inside of Wick's collar (the neck symbolizes that which leads us, or which we allow to lead us, and the blood means that Santino's description of Wick's addiction to vengeance in the Reflections Of the Soul exhibit was accurate: blood is what guides Wick, at least at this point), meaning, that Wick's conversion is only half achieved, the rest of it is reserved for the next film, as we should have guessed. Why do we see the tape measure in this image? It's taking Wick's measurements to see if he "measures up" to the task lying ahead of him. It's our communication with God, His angels and His saints. When we use certain words and direct our thoughts and actions accordingly, "prayer" is a form of worship, as well as a means of request for help, guidance and intercession for prayers from others who have gone before us (such as the saints). If Winston were an ordained priest (or possibly he would have to be a bishop to perform the ex communicado sentence religiously) Wick, then, would be cut off from prayer: his prayers would not be allowed to reach heaven and entreat the Almighty for favor and forgiveness (I could be wrong about this, I know it's almost never used, even in the days when "standard" ex communication was used, ex communicado wasn't used then because it's so severe). Since Winston isn't an ordained priest, this doesn't apply, but Wick is in the opposite position: Wick now must pray, because a prayer is the only thing he has left. 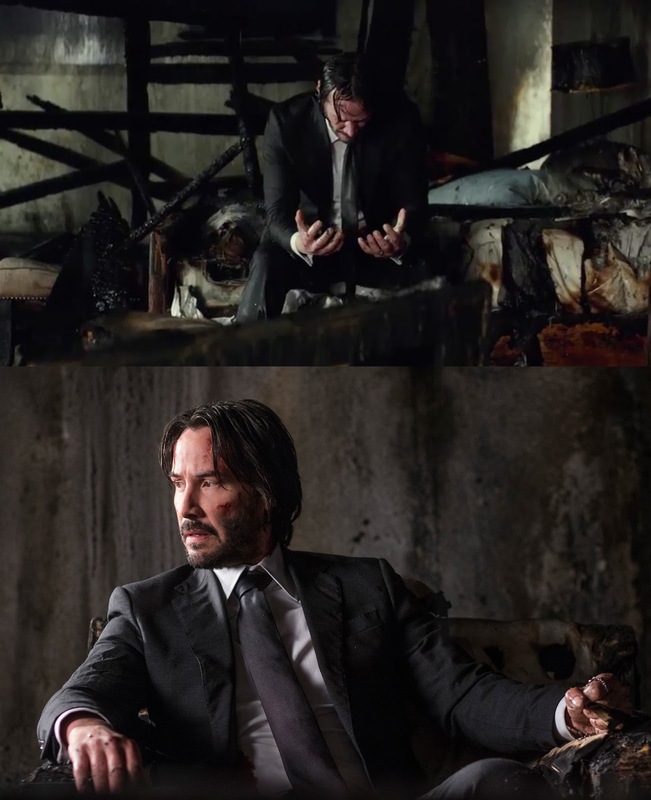 (IF YOU ARE REALLY INTERESTED IN THESE TATTOOS, PLEASE GO DOWN BELOW TO THE CAPTION WHERE WICK SITS IN HIS BURNED DOWN HOUSE, BECAUSE I AM GOING TO GIVE YOU ANOTHER INTERPRETATION OF THESE TATTOOS THERE. THANK YOU!). We saw this "ritual" of John's in John Wick as well: his showering before going to kill someone, as if he's cleaning his hands of the bloodshed to come before he sheds the blood because the spilling of the blood is "not on his hands," his hands are clean, and this is a sentence they have brought upon themselves (this is a bit different with Gianna slitting her wrists and getting into her bath, but we will discuss that in the caption below; this image is actually from John Wick; Wick doesn't shower prior to "visiting" Gianna, but we do see the tattoos as he gets dressed for the night, reminding us how important these tattoos are to Wick and his story as a character). It's important to remember that on Wick's left shoulder, he has another tattoo: the Cross (please see Specialized Waste Disposal: John Wick for an image and more details). The shoulders and back are usually taken together symbolically, and yet they have their own roles in communication: the back symbolizes our burdens, either those placed upon us or that we take upon ourselves, while the shoulders, as part of the arms, symbolize whether or not we receive strength from our burdens (on our back) or are weakened by them. 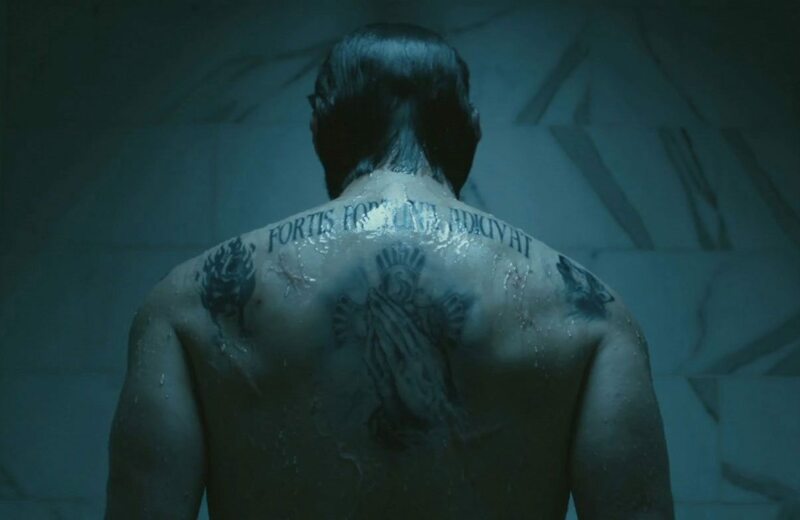 In the case of John Wick, he's strengthened by them, because he has the cross on his shoulder and on his back (since they are tattoos, he has placed them there himself) however, the problem is, there are two other tattoos: the woman wearing the mask on his left shoulder, and the howling wolf on his right shoulder. This "masked woman" is possibly Gianna because, after she tells Cassian to leave her so she can fix her make-up (and make-up is like a mask) she first wipes away the corner of her eye, just as the mask covers the eyes of the woman on the left shoulder. However, I don't think that's very plausible, and the masked woman still has to be revealed to us in the next film. Likewise, the howling wolf, is a part of Wick. It's imperative that, when Dante, author of The Divine Comedy, tries to get to heaven (like Wick trying to live a retired life of peace and quiet, and Winston, when he visits Santino to collect Wick's marker, says the same thing) Dante finds his path blocked by three beasts, each symbolizing one of the three major types of sins which block mankind from attaining heaven; one of those beasts is a wolf, which usually symbolizes a lack of self-control. When Santino "talks" to Wick in the Reflections Of the Soul exhibit (the perfect setting for this kind of discussion), Santino tells Wick that Wick likes the revenge and spilling of blood. So what does that mean? Back in 1985, there was a film called Brewster's Millions, in which Richard Pryor's character had to spend $30 million dollars in 30 days to inherit $300 million; why? Because the relative leaving it to Brewster wanted Brewster to become sick of spending money. We might say God is doing the same with Wick: kill so many people, Wick, that you become completely sick of the life you are trying to leave behind, but somehow always manage to get sucked back into and you will inherit the Kingdom of God. God can use our sins for good (consider, for example, how Ant Man uses his exceptional burglary skills to break in and steal a bunch of stuff so that stuff can't be turned against the world). As discuss below, Gianna and Santino both have to be destroyed so they won't unleash greater terrors upon the world, and Wick has to participate in his redemption so he won't face damnation; God using Wick to achieve God's ends is loosely referred to as the "economy of salvation," because God is so efficient at how He controls situations and draws us into His plan for our eternal happiness. Wick wants this, as the tattoos on his back signify (you don't get a tattoo of the praying hands unless you are intent on going to heaven) but Wick also wants worldly goods, and worldly goods in and of themselves are not bad, except when they keep us from salvation and doing God's will; in this case, God is going to give Wick worldly goods, specifically, becoming so famous of an assassin that his legend will never die, and God is going to make sure Wick achieves salvation. Last but not least, if you think I am making too much of this, remember that for the marker which Wick gave to Santino, Wick's blood is the ink as the agreement that Wick will do whatever Santino wants, the blood is Wick's promise on the marker; with the tattoos, the ink replaces Wick's blood and Wick's body becomes the marker promising God that Wick will work towards salvation to avoid damnation. "Ink" and "blood" have an interesting crossover in the story of Wick killing three men in a bar with a pencil. The whole incident is rather reminiscent of when Jason Bourne (Matt Damon) takes a pen and sticks it in another guy's hand, but for Wick, he actually kills three men with a pencil; why? Because Wick uses their blood to "write" (in place of the pencil) his own story (his life and what it means to be "John Wick"). We see the incident later repeated, just before Wick finds Earl and tells Earl to take him to the Bowery King when Wick fights two Asian men in the terminal and kills both of them with a pencil; why does this happen? Because they ignored the story we hear at the very beginning of the film which Abram tells about Wick (and Abram, to his credit, believes all the stories, and this humbles him before Wick, which is probably why Wick lets him live, even though this is a big mistake). So, just as the Wick's marker uses Wick's blood instead of ink, so Wick makes blood and ink/pencil lead interchangeable in writing his story and his testimony about who he is as an individual. Only by the Power of the Holy Spirit, in other words, God Himself, as the Third Member of the Trinity, gives us His own Life (commonly called "Grace") so that we may offer our prayers to Him. How does the Holy Spirit appear to us? In many forms, but most commonly He appears as a bird, as when Jesus was Baptized and the Holy Spirit descended upon Him. (If you haven't done so all ready, please make sure you read the caption above this paragraph before proceeding, as that will help to establish the context for this discussion). Granted, we don't actually see Wick praying in the film, and that's why the second form of the ex communicado is so severe: John Wick will now be forced to pray, because, like Moses being cast out of Egypt into the desert, so, too, has Wick been cast out with nothing but what is in his heart but Wick is not alone: he has the dog (his animal nature) and he has the Holy Spirit. There are at least three places in the narrative where birds are important, which means there are three places where the Holy Spirit is guiding Wick and helping him. Okay, this is perhaps the most important scene in the entire film (at the very end of this post, you can watch a clip of this scene again). Let's start with "Gianna" and "Santino." "Gianna" is the Italian dimunitive form of "Joan," which is the female form of "John," so "Gianna" is very close, literally, to "John." "Santino," her brother, means "little saint." Gianna, however, does not become one "favored by God," which is what John means, as her brother does not become a "little saint," and certainly not a big saint. Gianna's costume re-enforces this: in Hebrew, (remember the Jewish book keepers at the start of the film, and Wick being called "Old Testament") the word for "silver," the color of her dress, sounds like the word for "word," in Hebrew, so silver has come to mean the "Body Of Christ," because Jesus was the "Word Made Flesh." Gianna wears silver because she has ignored the Word Made Flesh, and cared only about her own "word" (her commands to those beneath her) and having her will carried out (when she takes off the coat and looks at herself in the mirror before taking off the dress, she's proud of herself, even though she's really too old to be wearing a dress like that, and her body is too old, but this is her vanity, because she is literally standing at her vanity, the place where she puts on her make-up, and so we know she's vain). The color white, the coat she wears, either means faith, purity and innocence, or it's a symbol for a corpse because the person is devoid of faith, purity and innocence. In other words, we think of a coat as being "protection" from the cold, but Gianna's white coat has "protected her" from hearing and acting upon the Word of God (remember, she's the one who mentions "damnation" after she has slit her own wrists). The fur edging around her neck denotes the animal instincts and passions, like the tattoo of the howling wolf on Wick's right shoulder; because the fur wraps about Gianna's neck, it tells us that she has been led on by her animals appetites, mainly for power and money, as we gather from the conversation she has with Mr. Akoni about the people she had murdered. After her conversation with Akoni, she tells Cassian to leave so she can freshen up her make-up and, when she sees Wick behind her, she's looking in the mirror, but she's not "reflecting" upon herself and the horrible things she did to Mr. Akoni and his people, but she's fixing her make-up, in other words, she is a horrible person. When Gianna asks Wick, "What would your Helen think of you" for killing me, a woman? I think Helen would be proud of Wick for taking a terrible woman like Gianna out of existence. This is really important: all the candles you see in this room? Those should be prayer candles, that is, in 1 Thessalonians 5: 16-18, the Bible tells us to "pray without ceasing," and lighted candles is a way to make a prayer offering and the light of the candle is the light of your prayer that doesn't cease to pray, but these aren't doing that for Gianna, they are empty candles. Likewise, the water is drawn for a baptism, but she doesn't care to be washed of her sins, only to have control of how and when she dies. Why? She's a feminist. She cares only about herself and how much power she can accumulate, without caring anything about anyone else (as her revealing conversation with Mr Akoni demonstrates and the reason why she takes off her dress in front of Wick: we have seen her "exposed" and how she really is in not caring what happens to other people and being willing to murder to get what she wants; this is the reason she uses her hair clip to slit her wrists: hair symbolizes our thoughts, so her razor-weapon being in her hair symbolizes how deadly her thoughts are, even so deadly that they kill her). Now, what about the "father" Santino mentions to Wick who left his chair to Gianna instead of leaving the chair to Santino? The "father" would be God the Father, and He left the chair to Gianna as a test so she could choose life or death, and Gianna chose death, in the people she murdered and in murdering herself; we know that Santino will take New York for himself, so he's just as bad, so both brother and sister must be executed, and Wick is the only man who can do it (more on this below). Without a doubt, the most important two lines of dialogue in the film are: Gianna asking, her blood flowing from her wrists, "Are you afraid of damnation?" and Wick immediately saying, "Yes." Gianna says, I always thought I would see it coming, and the truth is, she did just see it coming: she saw it behind her in the mirror, and it would not have been anything for her to bow her head, pray a Hail Mary, ask for God's mercy upon her soul, and let Wick shoot her dead; her immortal soul would definitely have been saved because God will not refuse any soul who asks for His mercy. But she didn't want mercy; she wanted to die her way. God knows this. God is so merciful, that He knows Gianna will not ask for the mercy she needs in order to escape damnation, which is another reason why God sends Wick to kill her: Wick will have mercy upon her soul on God's behalf, and Wick shooting Gianna in the head is a way to take the sin of her death upon himself, so the sin of suicide isn't on Gianna's soul when she immediately stands before God in judgment. Wick can still do penance for killing Gianna, but Gianna cannot do penance for killing herself (in Dante's Divine Comedy, those who commit violence to themselves are placed in the Seventh Circle of Hell where the Suicides are, however, the Church has ruled that a person is not necessarily lost if they have committed suicide and we are still bound to pray for them). Wick has so much compassion for Gianna, he takes hold of her hand, soaked with her own blood, and has he does, we see her fingernails, painted black; why? It reminds us of the way "death" was her strength in life, and that death has completely gripped her so that she cares not for the life of anyone else but herself; she doesn't even care for her own life, does she? And that is what the slow, day-to-day journey of feminism does to a person (men included) because it leads you away from God, and this is a blessing to Wick, so that he can see Gianna in her last moment, and vow it won't happen to him. Now, some might question, why doesn't Gianna try and make a deal with Wick? Fake death so Wick can get the marker back, then they go after Santino together? For one, Wick would not be following the rules and honoring the marker, for which he could face serious consequences; two, Gianna is just as bad as Santino, so why deal with a devil just to let loose a demon? They both must be disposed of, and it's because of Wick's sense of justice and righteousness that he's the man to do it. Obviously, the Bowery King and his carrier pigeons are important; why? John Wick--as is the audience rooting for Wick--are nervous the whole time Wick is in the presence of the Bowery King that the $7 million contract on Wick's head is going to win over and, instead of helping Wick, the Bowery King will help himself; that's the power of the Holy Spirit at work, that the Bowery King is able to be an instrument of God rather than a hindrance to God's work (I know, you are asking how is John Wick killing all those people the work of God, but give me a moment and we will get to it). Then, there is also the scene when Winston tells Wick that Wick is ex communicado and a flock of birds fly up from behind Wick, signifying that this is the Will of the Holy Spirit and God is with Wick and everything will be okay. If it weren't for the Bowery King giving Wick a leg up and getting him into the museum, John would have failed; if it weren't for Winston giving Wick an hour before the ex communicado goes into effect, Wick would have died right there. The third important bird reference? The Bowery King (Laurence Fishburne). The politics of the film are strewn throughout, however, I am going to concentrate my discussion on politics here and now. First, it's a sign of the Bowery King's power that, when Wick is running and injured, he sees Earl, drops several gold coins into the cup, states his name (which everyone knows is worth $7 million at this point) and hides, kills for, transports and bandages Wick in spite of the contract because Earl knows the Bowery King is in charge and not he, Earl, himself. At the same time with Earl knowing he's just a servant to the Bowery King, we know "Earl" is not just a name, but a title and designation of the aristocracy, so Earl is, in his own right. a high-ranking member of the assassin community. When Wick comes face-to-face with the Bowery King, Wick knows he has to offer him something in exchange for the help Wick requests from him (again, this is an example of Wick being in "communication" with the community he's from and being able to score help and resources from others). When the Bowery King is with Wick, he says, "John Wick. You're not very good at retiring." Why? Because this is the era in which white, heterosexual men have been "retired" by feminists, blacks, gender minorities and socialists because white, heterosexual men are the dominant power-holders in society, and in order for the marginalized minorities to take power the power-holders have to be marginalized. "Helen," in the political interpretation of the film, is the dead motherland, the America who loved the white, heterosexual men like Wick who made America great, but who has died because of some disease choking the life out of her. Wick knows, before he even comes to the Bowery King, that he has to finish Santino and bring the wrath of the High Table upon himself, because that is what heroes do, even though John Wick isn't seeking to be a hero, he does want to do the right thing, and he tells the Bowery King as much. When the Bowery King meets Wick, he does something extraordinary: tells the story of Wick giving him "a gift." This really is extraordinary, given the hostile state of racist tensions in America today (obviously this is just a film, but this scene is meant to address those tensions). Instead of condemning Wick for the scar, he thanks Wick for the lesson he learned and credits Wick with his "ascension" to becoming the Bowery King. In The Magnificent Seven, it's the exact opposite: Sam Chisolm (Denzel Washington) has a neck scar that has led him to seeking revenge against Bogue who gave it to him, rather than seeing that it has been any kind of good lesson from which he has learned. The scar being on the neck of both these black characters is important, because much of the tumult in America now can be summarized by a scar: those blacks who hold the scar of slavery (and other scars they claim whites have imprinted on them because of "white privilege") and those blacks who have ascended in spite of scars, real or imagined. It's not a coincidence, dear reader, that the Bowery King holds the pigeon while he talks, because we are meant to know that the incredible protection Wick has in not being killed for the $7 million contract in this scene comes directly from the Holy Spirit which the pigeon symbolizes (and we discuss this with the "duck fat" further below). Wick makes clear to the Bowery King that war is coming because of Santino wanting New York, and no one can avoid it if it comes, but it's best to keep it from coming; how on earth is this political? Because the Bowery King will end up exactly as Mr. Akoni's family and people if the Bowery King doesn't take Wick up on his offer to be a "sacrificial lamb." How, if at all, do we tie in Santino with socialism (and it's exceedingly easy to do)? All of New York will be under the control of one person, after there has been massive blood shed; who does that? The socialists. Any socialist/communist revolution starts with massive blood shed and the total take-over by one person, whereas there was numerous people running the organization previously. Now, to back this up substantially, and to demonstrate to Wick that the Bowery King knows exactly what is going on, the Bowery King--who could give Wick any kind of gun in the world--chooses to arm Wick with a Kimber manufactured M1911 pistol which was the same gun used by American service men throughout the Cold War. This clever innuendo signals that Wick is not only fighting for himself and New York, but for the whole country just as the service men and women in the army did with the Kimber M1911. Last but not least, we have the two last lines we hear the Bowery King say which is of such great importance. First: "Your descent into hell begins here," because this IS John Wick's descent, it belongs to him and it's a part of his singular destiny to take it upon himself. But this is a road leading to hell, and just as Dante has to go through hell to get to heaven in The Divine Comedy, so, too, does John Wick (with Charon latter appearing to ferry him across, just as Charon does in Inferno). This "descent into hell" isn't just the gun-fight, then the ex communicado by Winston, it's also the descent within Wick to find all the hell within him, specifically, the hell of the howling wolf (please remember that, when Dante wants to go to heaven, one of the three beasts blocking his path is a wolf) which Wick has tattooed on his right shoulder. The second important dialogue line the Bowery King has is, "Remember, you owe me," and Wick replies, "You don't want me owing you." Wick is right. The whole film has been about Wick owing Santino, and how Santino ridiculously throws away his life over jealousy of his sister and greed for New York. Why does the Bowery King throw out this last line? For two reasons: first, as a lesson to us, the viewers, that sometimes it's actually in our own best interest just to do a random act of kindness just to do it and not expect anything in return, instead of telling the person we helped, "You owe me." Second, it shows that the Bowery King, while a good character, isn't wise or even--dare I say it?--"infallible" like Winston who doesn't make any mistakes at any time in the film. We will probably see the Bowery King again in the next film, and we should remember this (and the "You owe me," line may actually foreshadow the next film). When Santino goes to Winston and tells him to revoke John Wick's membership to the Continental, and Winston refuses, Winston reminds Santino that he, too, enjoys the privileges of the hotel; why does Winston do this? So that John won't do what John did at the start of the film, which was make a big mistake. Don't make peace with your demons. Why does the fight with Cassian take so long for Wick to win? Because Cassian symbolizes the inner-guilt Wick feels for killing Gianna (Cassian is going to bleed to death just as Gianna did). Wick knew he had to do it, but he didn't want to, and it's that difficult for Wick to overcome his feeling of guilt for what he did. This is why we see Cassian wearing blue: he's a symptom of Wick's depression and sorrow. This is the reason why Wick argues with Santino that it would be impossible to kill Gianna: the guilt would cause him to not want to do it, or the guilt would kill him afterwards. This is why Wick stabs Cassian in the heart, because it's Wick's heart that "bleeds" for Gianna (compassion and wishing he didn't have to kill her) but his mind tells Wick he did the right thing, which is what wins out over Cassian in the end. Remember, when Santino tells Wick that Santino wants Wick to kill Gianna, Wick states "It's impossible." As we watch the sequence unfold, it doesn't seem that it was all that difficult for Wick to kill her, especially since she "helped him out" by committing suicide. However, the "logistics" of killing Gianna probably wasn't what Wick was talking about, rather, the friendship between Wick and Gianna (which Gianna mentions as well) and how that's going to make it impossible for Wick to kill her. Please note, in the bottom two images, how--when Wick finally kills Cassian--it's in a subway car full of windows, because this is the moment of real "reflection" upon what he has done (and the help he's going to need to finish it). Now, when Cassian and Wick initially fight, and Wick and Cassian crash through the window into the lobby of the Continental Rome, it's because Wick has been "fighting himself" on what he did, but then Wick reflects (the crash through the window) and realizes he did what he had to do (this is of course, reading Cassian's character as an extension of Wick's interior processes). Then, when they have a drink, Cassian mentions that he was fond of Gianna and she was his ward, that is Wick reflecting to himself how very possible it could have been that Gianna would have had Wick kill Santino, and the two of them are really both rotten. That realization still isn't enough to save Wick the trouble of finishing the fight with himself, but when Cassian tells Wick, "I'll make it quick. Consider that a professional courtesy," Wick is actually consoling himself that he did make it quick for Gianna, that it was a professional courtesy to her that he allowed her to do it "her way," and that he made it quick and took the sin of her death upon himself. It's fight scenes like this, when a character wrestles with their own thoughts, beings and actions, that makes a good character and a great hero. When Wick repeats that to Cassian in the scene of the subway car, and Wick finally overcomes him, again, it's Wick overcoming his own sense of guilt for everything, but finally he has worked through it and reminds himself that what he did, was the right thing. This feeds in, simultaneously, to what Ares (Ruby Rose) plays, because--as we discuss below--Ares is to Santino what Cassian is to Gianna, namely, the physical manifestation of guilt that Wick feels for killing them, but it's more complicated with Santino, as we will discuss. Note that, in the subway car, when Cassian and Wick fight, Cassian stabs Wick in the leg: legs symbolize our standing in society, and to be stabbed means that Wick feels he has lost his standing because he killed Gianna (Wick's face also has several bloody abrasions, meaning Wick also feels he has "lost face"and it's effected how people have viewed his character for what he has done and knows he still has to do). In the opening sequence, after John has his car back, he goes into the office of Abram (Peter Stormare), and Abram--as well as the audience--is confident that Abram is going to die at the hands of John Wick,... instead, John pours them both a glass, and they drink to peace. This is John's mistake for which he pays throughout the whole film. 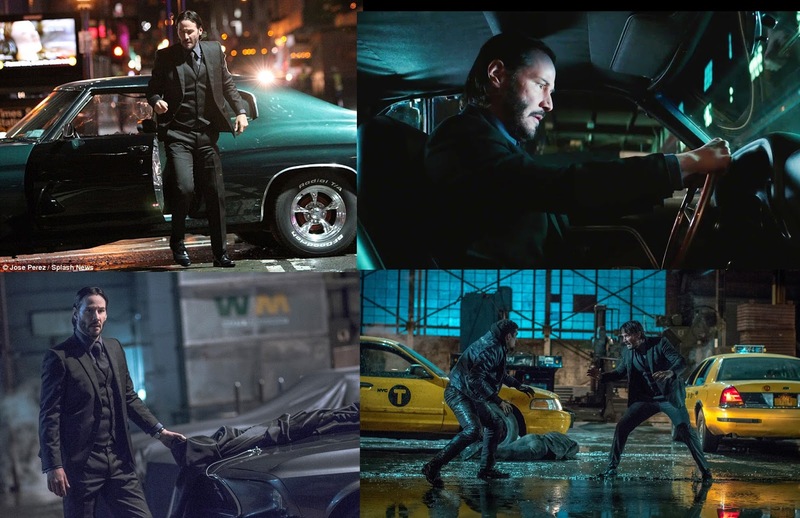 No, Abram doesn't come after John Wick, but Abram participated in the offenses against John Wick by holding onto Wick's car (please see the commentary in the caption below the images of Wick and his car at the top for more on this topic) and in not killing Abram as Wick should have done, Wick allows the seed of sin to remain and, in only hours, it has grown with a vengeance and Santino comes knocking on John's door. Why is it Helen's bracelet that survives the fire? Because it symbolizes the bond that was between them. Not that of master and slave, but a bracelet is worn around the wrist, just as handcuffs or irons are, but this was one that was voluntary for the sake of love. so it's a sign of their marriage, but also, that Helen was the only person with whom Wick had ever had a bond with. In other words, Helen was the only person with whom Wick could fully communicate and be in communion with, so the sentence of ex communicado actually--in many ways--went into effect for Wick when Helen died, because no one can take her place for Wick, at least not at the moment. In at least two different scenes of the film (and possibly more, there was so much in every scene, it's possibly, and even likely, that I missed some of it) there are two classical states of women, which I am confident are meant to be manifestations that Wick is thinking of Helen. The first time is when Wick returns to his room at the Continental Rome after killing Gianna, and he looks at his busted phone screen (probably trying to watch the video he had taken of Helen); why? Because Gianna asked Wick, "What would your Helen think of you now?" and Wick worries; to Wick's side, by the window, is a classical state of a woman who surely is meat to convey that Wick thinks about Helen at that moment (why? "Helen" is a classical name, specifically, the famed Helen of Troy "whose face launched a thousand ships," but more on this in a moment with his tattoos). Then, when Wick has been taken in by Earl, and Wick wakes up to find his injuries bandages, he sets up and sees the two janitor/assassins who tried to kill him, dead instead of himself, and in the corner, for absolutely no reason whatsoever, there is another statue of a classical woman, again, likely a sign that Wick is thinking of Helen and how close Wick has come to death; possibly even that Wick--in this moment--wishes he were dead to be with her again, or at least not to have to live without her. The statues, besides just showing us that Wick is thinking about Helen in these moments, also communicate something else to us: they are classical, they are solid statues and they are of this world, as Helen herself was. Again, Wick was meant for better things, and Helen was just the first taste of what God wants to give Wick, when Wick has earned it and proven himself worthy; how does Wick do that? By showing that he truly doesn't want to be an assassin anymore. NOW, regarding Wick's tattoos: it has been the trend to translate the motto tattooed on the top of Wick's back as "Fortune favors the bold," which is roughly what the US Marine Corps has for their motto, but there are problems with this, as the amateur translator of Classical poetry, Benjamin G. Griffin points out, in an excellent analysis, and a far superior translation is, "It is only the Strong that Fortuna (the goddess) comes to save." The Roman goddess Fortuna was the personification of "luck", not Christian blessing, and this pagan manifestation is, I would like to suggest, Helen herself. The interpretations up to this point are still plausible and valid, but I think this is a far deeper and more accurate understanding, namely, that just as "It is only the strong that Fortuna comes to save" is written above the praying hands and cross is because Wick's devotion to the goddess Fortune came before and superseded Wick's faith in God; now, however, God has come to claim Wick as His own, and that means leading Wick away from the pagan life, including Helen. The reason we see those two Classical statues of women (when Wick is in his room at the Rome Continental, and then in the furnace room when Earl disposes of the two janitor assassins who tried to kill Wick) is because they are meant to summon Helen to our mind, and to summon Helen to our mind as a Classical, i.e., Pre-Christian goddess to whom Wick was devoted. MORE IMPORTANTLY: in these moments, Wick is thinking how lucky he has been to have escaped, both Cassian's counter-attack for killing Gianna, then Ares' attack to "tie up loose ends," then, when Wick wakes up by the dead janitor/assassins, Wick thinks again how lucky he was that he found Earl to help him, (because, again, both of these Classical female statues are meant to make us think of Helen, who is really a code for this Goddess of Fortune tattooed on his back); it's God who has brought Wick through these trials, because Wick is doing God's Will, even if Wick doesn't realize it; so that we realize it, there is that huge sign in the soup kitchen, JESUS SAVES as Wick is led to the Bowery King, not the Goddess of Fortune. The bracelet then, in the image we see above, which survives the fire, is the chain of willing slavery which Wick offered his pagan goddess Helen as a marker of his servitude to her (and not to God). "Our God is a jealous God," Moses told the Children Of Israel, and He will not stand for any gods before Himself. Remember, Winston tells Santino that, in destroying Wick's house, he burned down the temple of the high priest. That "high priest" was, in fact, Wick himself, to the cult of the goddess Fortuna who was personified by Helen (remember, we also see the idea of "luck" explored thoroughly in Mission Impossible 5: Rogue Nation when Alex Baldwin's character accuses Ethan Hunt and friends of just being lucky in their exploits). The thing is, we all do this in our lives. We all willingly make ourselves the slaves of Egypt, and God has to lead us out and into the Wilderness to purify us from our desire to be slaves to evil, which is what, after all of this, Wick still is, because he still found his "tribute" to Helen, the gold bracelet, which he gave her as a sign of his slavery to her (as the goddess Fortuna). So, this means, God still has a lot of work to do on Wick, which is why Charon shows up: "If you are so inclined," Charon tells him, meaning, Wick, this has to be an act of your free will, but God is going to completely tear every trace of Helen out of your existence and give you something far better to love. The reason we the audience see this happening to Wick is because it so often happens to us (I know it has happened to me personally, and fifteen years later, I am begging God to finish my trials in the Wilderness where, because He loves me, He is perfectly happy to leave me to be destroyed by my demons, or let me destroy them). In the lounge at the Continental, when Wick walks in with his gun, all of us know (because we saw John Wick and how Ms. Perkins was executed for breaking the neutral grounds in her attempted hit on John himself) that John is in for it if he pulls that trigger,.... and he pulls it anyway. Why? Because the Holy Spirit told him to. How? What does Santino tell John? That he could stay there a long time and not eat the same thing twice. There is a double meaning to this, a warning, but also an invitation, and fortunately for Wick, he refuses both, and it's because of the symbolism of the duck fat (I'm getting to it, I promise). "Whoever comes, I'll kill them. I'll kill them all." "Of course you will." These are, definitely, the two second-most important lines of dialogue in the film; why? Because it gives us a choice, just as Wick gives the Bowery King a choice: either we think Winston insane for letting all those assassins line up to get killed by John Wick (because the definition of "insanity" is doing something over and over thinking you will get a different result and, by now, doesn't everyone realize that none of them are going to be able to kill John Wick?) or we realize that Winston has sent Wick upon the great challenge, a "night of the soul" greater and more difficult than Wick's original "Night Of the Impossible Task" and the battle which will move Wick beyond, "The man, the myth, the legend," to being, quite frankly, a saint, the saint "Santino" ("Little Saint") was meant to become, but couldn't because he allowed himself to be mislead by worldly affairs. John Wick will kill whoever comes because he's got back his focus, commitment and will, not in spite of having lost about everything, rather, because he has lost everything and there is nothing else to lose. Why does Winston do this to Wick? Doesn't Winston like Wick? The first word we hear Winston say in the film is, "Impeccable." The gold coins used in the John Wick universe open up the scene when we first see Winston: why? Gold does not tarnish, and it is the most valuable substance on earth, worthy of kings and an apt metaphor of the soul because our souls are worth far more than gold, but, like gold, our souls must be purified in the fires of trial and purgation, and Winston telling the Numismatic (the man with the coins) that the coins are "Impeccable," meaning that is what John Wick is to become himself, "Impeccable," a soul without blemish. Then Wick appears, and because of the juxtaposition of the Numismatic and Wick, we can be confident that Wick himself is destined to become "impeccable." Like Ares, who doesn't speak, the Numismatic doesn't say a word either, rather like God Almighty Himself. That doesn't mean that God isn't acting, as we see with symbols of the Holy Spirit, but that Wick is not yet ready to receive the Word of God because Wick is still tied to his pagan goddess Fortuna in the person of Helen. Something left "unsaid" by Winston and Wick is quite important in this scene, as well: Wick's free will caused all this. When Wick asks Winston if the Continental is still open to him, and Winston explains that no, it's not, Wick looks depressed but understands that it's Wick's own fault (although he had to do it as we explain elsewhere). Wick's free will in action--killing Santino in spite of the consequences--becomes an important political statement because Wick doesn't blame Winston for withholding the safety of the Continental from him, and doesn't throw a temper tantrum, as many liberals do who deny that they themselves have free will and they are a victim of the cruel universe. This writer at ScreenRant has an interesting theory as to why Winston returns Wick's marker to Wick: this writer thinks Winston is giving Wick Winston's own blood marker, that is, Wick can call upon Winston for a favor, just as Santino called upon Wick. While this is wildly interesting, and a very keen observation, I do have to disagree with it: first, in the image in the center of the three images above, when Winston hands the marker back to Wick, Winston doesn't say, "Here is my oath to you, Jonathan," instead, Winston says, "I can give you one hour." So, if Winston were agreeing to give Wick something like that, he would mention it, and since he mentions the hour, and nothing else, I don't think Winston does give Wick a blood oath. Secondly, a blood oath is given in exchange for something else. Wick hasn't given Winston anything except a carpet stain in his hotel lounge with Santino's blood. When Winston has the marker, he gives it back to Wick, which is its own gift because now Wick is not beholden to anyone else (anyone else like Santino) so, the "Rules" which Winston encouraged Wick to follow at the start of the film are now put aside and Wick is going to "lay with the animals" because he has to learn to discern the animal in him before it can be exorcised, because, trust me, that is the point of this film,... actually, it's the point of all films. However, Winston does say, 'You may need this," as in, you may need to make a blood oath to someone who can protect you from the justice you have brought down upon your head." Who would that be? Perhaps the Bowery King, who has shown he has resources and appears to like the idea of Wick "owing him," and he would be in a position to bargain with Wick for protection in exchange for some of Wick's "skills." As we have noted before, the great irony of Hollywood is, we go to see action-filled films about saving the world, because all the characters want to get back to the save boring, normal routine that we, the viewers, are fleeing in going to see that film with the heroes saving the world. Wick wants to get back to a normal, boring routine: the routine where "her" coffee cup is next to his, but full; "her" car is parked next to his, waiting for "her"; "her" towels are next to his, waiting for "her" to use them. God only takes something away from us in order to give us something far better, and the more and better we cooperate with him, the faster He can bring that to completion; the more we resist, the longer it takes. Now, about the scene. First of all, Charon (named after the mythological figure, because Charon has "ferried" Wick from the ruins of his old life to the trials of the new life) points the way for Wick to go and Wick descends down numerous steps: going down steps means we are digressing, we are going into our psyche, just as--at the beginning of the film--Wick descended the steps of his basement to, once again, bury his guns, coins and ammo, so now, Wick is actually burying the old John Wick to become something that no one can possibly expect him to become. When we see Winston waiting for Wick, he sits on the edge of a fountain, a fountain where there is no water. Wick doesn't need the reflection which the water in the fountain would symbolize, because there is the Holy Spirit there, the real power behind Winston. When Wick asks Winston, "Why am I not dead?" Winston replies, "Because I deemed it not to be," and nods to the man who says, "Now," and everyone stops on that signal (another code used in the film). This has two important points. First, it's an obvious reference to Moriarty (Jared Harris) in Sherlock Holmes 2: A Game Of Shadows, when Moriarty has tea with Irene Adler and, on his signal, everyone in the restaurant gets up and leaves, as he has slipped her a deadly TB virus to kill her instantly. John Wick Chapter 2 cites this scene to remind us that Moriarty used his power to kill Irene, whereas Winston, who has every reason to kill Wick right now, including $14 million dollars for one, well-aimed bullet, does NOT kill Wick, but even gives him extra time to escape; why? Because, in another anti-socialist stance the film takes, good capitalists know somethings are far more important than money, even a lot of money, and that's Winston's friendship for Wick, even though Wick will probably never be able to repay Winston for what he has done for him. After all the people in the park leave Winston and Wick alone, we get a really good look at the fountain: it's an angel, with birds perched upon it's wings (the "perched" birds might be a well-placed reference to Ms Perkins who was assassinated for less than what Wick actually achieved), but this is the sign of the Holy Spirit, who has influenced Winston's heart not to take revenge on Wick and, instead, to help him. When Winston calls Accounts Payable, he gives them the code, "11111." This adds up to "5" which is the number of the Law as St Augustine tells us in The City of God. Augustine writes, "David took five stones out of the brook and put them into the shepherd's scrip. The five stones were the Law; for the Law is contained in the five books of Moses. And in the Law there are ten commandments affecting our salvation, to which all the other precepts are directed. Therefore, the Law is symbolized both by the number five and number ten." So, we can easily see that, because Wick has broken the Law of the assassins, he is now under the law, but there is also God's Law which Wick will have to negotiate. The second purpose of the symbol of the number 5 is control of the senses, as St Augustine goes on to say, because by the power of the Holy Spirit, we are able to gain control over ourselves (like the howling wolf on Wick's shoulder he has to gain control over). So, because of the Hasidic Jews, to whom Wick goes when he needs his "baggage" for "hunting," and when Santino tells Wick he's "so Old Testament," we know these symbols apply to Wick. Again, when the "order" goes out to all the cell phones, we get a quick look at the Bowery King and, what happens? As the numbers are sent to cell phones, the Bowery King releases a group of pigeons, thereby, sending out, so to speak, an abundance of grace to Wick. During this conversation with Accounts Payable, Wick has started the "journey" he will be on in John Wick Chapter 3: the ascent up the stairs. Just as the long walk from his burnt down house to the Continental was the narrative of Chapter 2, so the ascent up those stairs will be the whole narrative of Chapter 3, because to "ascend" means that we are changing our minds, we are entering into a higher form of consciousness and understanding about what is happening and how we are supposed to respond. The cell phones going off as Wick walks by different people are a familiar symbol: answering "the call," the "call" God makes to each of us to allow the Holy Spirit to fill our hearts with Grace and respond to the Call of Life with Him. It's the phones of the assassins ringing, but the call is being put out to Wick, because he has no one else to turn to, he has no one else to help him. As a testament that this is an accurate reading, Wick goes from walking to running, because now, he's ready to "run the good race" which St Paul commends all Christians to run: to become "athletes of God" and train hard in exercising the Christian virtues so we cannot be overcome by sin. Again, the assassins we see are just metaphors of all the people we ourselves meet everyday who could potentially lead us into sin and away from God because they assassinate our souls and the eternal Life therein. Likewise, we have the power to assassinate the souls of others, or to give them the life giving water of prayers and kindness to help them along their own path. Santino puts some food in his mouth, which has supposedly been fried in duck fat; because ducks are birds, like the birds we have discussed, this means, symbolically, that this is the food of the Holy Spirit, compelling Santino to tell the truth (which, in this situation, isn't difficult to do) but it also helps Wick to see the truth: Santino isn't going to go away, so then, Santino will be able to get control over New York City AND get Wick killed or have constant attacks carried out on him by other assassins (unless Wick stays in the hotel, too, which wouldn't be very comfortable for either of them). In other words, God communicates to Wick what is going to happen if Wick doesn't finish Santino right then and there it's going to be war for everyone. So, the duck fat is a means of Wick recognizing what the future holds for all of them. 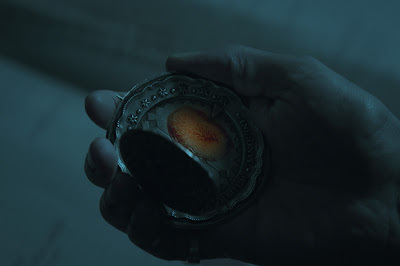 Debitum sanquine, or Blood sum given, is the translation of the writing on Wick's marker, meaning, roughly, blood for blood: if Wick fails to fulfill the oath, only Wick's blood can pay the sum of the oath. I said I would leave all the politics to the discussion of the Bowery King, but that wasn't quite true; it's not that I was lying, but this is probably a political discussion, but it just didn't fit under the Bowery King discussion. So, what we have is an oath being used as a monetary unit. For example, Wick was willing to pay in his own blood, for Santino to help him on the Night of the Impossible Task, and it's only with someone else's blood that Wick can pay the debt to Santino. This is a currency. How is this political? Because socialists want us to think that currency is bad and causes us to do bad things, but in reality, it's a wretched part of human nature. Remember the way Santino and Wick both put their finger on the marker and were sliding it across the table towards each other? We see Wick doing that later with the gold coin at the suit maker's shop when he slides a gold coin towards the Asian woman who then takes him into the back room; the technique of holding the money is the same as with the marker. Another reason we should view blood as a currency (besides the obvious two contracts, the first for $7 million and the second for $14 million offered for spilling Wick's blood) is the "price" Wick has to pay for spilling Santino's blood. There are two prices to be paid, actually: the first price is to the Comorra, the High Table, who seeks to avenge Santino's death, and the second price is to the Continental for killing Santino on Continental grounds. (If you think I'm making too much of the "duck fat," I would like to point out that in King Arthur: Legend Of the Sword, there is a character who is part of the Resistance against Vortigern [Jude Law] who is called "Goose Fat Bill," and is likely the one who saves Arthur from being beheaded). This actually leads us back to the Bowery King and the "deal" Wick describes to him. "Are you here for the pope?" Julius asks Wick (image in the upper, left hand corner). This is an excellent example of deconstruction, because the question can mean two totally different things. When Julius first asks, I assumed that Julius meant, "Are you here to assassinate the pope?" and the question can certainly mean that; it can also mean, however, "Are you here for the pope (to assassinate someone on his behalf)?" but it can also mean, "Are you here for the pope (and to receive his blessing and the sacraments, because you have committed so many mortal sins, you have to receive forgiveness at the hands of the pope himself)?" Because we can't anchor the question in a definite meaning, it's ambiguous, and therefore, deconstructs itself (because we think of language as being concrete and definite, that we can always say exactly what we mean, finding ambiguous language where we can't find a definite meaning helps us to better craft our own language). As far as services and knowing where to go for help, we deal with this in the main body of the post. However, what I would like to discuss herein are the codes. The reason it's important to find codes in film--and they take a variety of forms--is because it validates that the whole film is, essentially, a code: a message written in an encoded form to communicate something to its audience. Sometimes "metaphor" is used, and it's the same thing, but the language is different, and if we can learn how to decode the films, we can better understand the message, rather than just passively and unconsciously taking it in. So, when Wick arrives at the Continental in Rome, he says he would like a room, then slides a gold coin part-way across the counter so Lucia, the hotel director, knows what "kind" of room he wants. When he returns and asks Lucia if the Sommelier is in, she replies, "I have never known him not to be in," and he goes into the gun room instead of a wine cellar. When he tells the Sommelier he wants something "big, robust," the Sommelier has to interpret what he's talking about to find a gun that will meet those "requirements." As Wick leaves the Sommelier's, the Sommelier calls out, "Mr. Wick, do enjoy your party," "party" being a code word for something like a "killing spree." When Wick was earlier at the office run by the Hasidic Jews, the old man calls out to Wick as Wick leaves, "Happy hunting, Mr. Wick," knowing that Wick is back on the job and hunting a person. These are all "code words," words that mean one thing when you or I say them, but something entirely different in the world of John Wick. What about language? How is it that Wick knows Russina, Italian, Hebrew, sign language and I'm sure some other languages as well? Because it's a part of him and he's a part of it. To Wick, they are not different languages, they are THE LANGUAGE of the assassin world, and to be an assassin is to know its language, like knowing which homeless people on which corners work for the Bowery King and which ones don't. Wick explains to the Bowery King, if I don't kill Santino, then Santino is going to take over NYC, so, give me a gun and then I will take upon myself the wrath of the High Table and the Camorra, (the Italian mafia, which Santino was part of, and will seek vengeance for Santino's death). Again, as Wick is led to see the Bowery King, he passes through a soup kitchen, where people are being fed, and sees the large picture on the wall with a cross and the words, "Jesus Saves"; what does this conjunction of symbols mean? Who are these ladies? Sure, they are "accounts payable," but aside from being an account for assassins, this is also an account that has to be paid by society for the way society has allowed women to become. The technology is analog and manual, not digital, one, so that they can't be hacked, but two, to take us back in time, like maybe the 1950s, as well as the ladies pink shirts, hairstyles and gray pencil skirts. The 1950s were a time when women were ladies and men were gentlemen, but neither category exists in today's world; why not? Because we have sinned. We have violated the laws, and we have lived just as God warned us not to live. How can we deduce that from these women in this strange setting? Their arms. Just as Wick has tattoos on his back which detail his journey from worshiping the Goddess of Fortune in Helen, so these ladies--with all their tatted arms--reveal they aren't the women who pray for their men (like the praying hands on Wick's back), rather, these women are tough and players (the playing card symbols are tatted on the fingers of one woman typing up Winston's decree of ex communicado) and when the women have gone to hell, the men are going to follow. This is the basic reason why, the film makers pre-empt, that Wick can't just "find another woman," to replace Helen, that is, because there aren't any women left who aren't all assassins like him. In order for Wick to be "saved," he--and every other man in the world--needs the help mate God created for him so she can help him get to heaven, because man certainly can't get there on his own. These women, in this little "margin" of the film, provide the film makers an opportunity to make a social commentary that is likely to skip over the notice of many viewers. Now, how can I make such a sweeping generalization because they all tend to have tattoos on their arms? The arms are symbols of our strength, and just as we saw a Cross tattooed on the left shoulder of Wick, and his back, we do not see any such tattoos on these women, meaning, they get their strength from random, worldly things (whatever their tats happen to be about) rather than the strength of God. Given that Helen herself is a pagan goddess in the film, and Ares is an assassin who dresses like men, and Gianna a power-hungry, selfish feminist who doesn't even understand what "damnation" is all about, there aren't any good women in this film, because there aren't any good women in society; again, if the women have all fallen to the easy life of sin, men don't have a chance. The film makers, however, are equal opportunity employers: they want men and women to improve their game. For example, we can easily read the references in JWC2 to The Kingsman Secret Service and Colin Firth's character's motto, "Manners maketh the man," and the emphasis on bespoke suits and well-displayed high-impact arms and ammo. Just as men need to improve themselves, so, too, do women, and the film makers make a concerted effort to point that all to all audience members. A light favored by God. There are three obvious and important characteristics about Ares (Ruby Rose). First, we never learn her name, so we can say, she is "nameless," which is always a bad sign for a character (like Wick's dog, the Pit Bull). It's only by looking at the credits that we learn she is called "Ares" the male god of war in Greek mythology (Mars in Roman). It's possible we are meant to view her in some contemporary gender-bending way, however, I think what is far more likely is that her femininity is a reflection on Santino's effeminate behavior (namely, that he has another man kill his own sister, instead of protecting his sister, then he vows to avenge his sister's murder, but can't even accomplish that, and was passed-over by his own father in favor of his sister to represent their family,... ouch. How many fathers detest their sons enough to do that? This father obviously did). Santino is ruthless, but he's not strong, and Ares reflects this. Secondly, Ares obviously doesn't speak, using sign language, which is one of the many genius stratagems of the film to deepen its message, specifically, that the film itself is saying things without actually saying them, like Ares' use of sign language is because she can't actually speak, and there are plenty of people today, especially in America, who feel they "can't speak" because of the repercussions by liberals for saying what is on their minds (like being a supporter of Donald Trump will literally get you beat you). Number three is that Wick kills her before he kills Santino. As I stated, Ares is to Santino what Cassian is to Gianna, but just as Cassian is a manifestation of Wick's inner-guilt for killing Gianna, so Ares is a manifestation of Wick's "guilt" and agony in deciding to kill Santino before he does it because Wick knows the consequences will be enormous. We first see Ares when Santino rings the bell at Wick's house; why? Because at the very moment that Santino shows up, Wick all ready knows he is going to have to kill Santino to keep from getting sucked back into "that life" of being an assassin again, which is why Wick doesn't even care what it is that Santino wants him to do for the fulfillment of the marker. Unlike with overcoming Cassian after Wick had killed Gianna, Wick's resolve is to kill Santino and Ares is the manifestation of Wick coming to grips with what he has to do, which is why, when everyone is in Reflections Of the Soul exhibit, Ares enters it right when the narrator of the exhibit talks about a person reflecting upon their soul, because Ares is a reflection of Wick's soul and one he has to completely annihilate so that killing Santino is an act of Wick's free will and that Wick does, indeed, finish it instead of letting it get away, like Abram. Ares' role in the film is why she says, "I'll be seeing you," because--as a part of his soul--Ares has a unique view of Wick's soul that no one else can see, but also, that the film makers make available for us the viewers to see. When, in the bar at the Continental Rome, Ares says, "I'll be seeing you, John Wick," Wick signs back to her, 'Not if I see you first," and that's the language of spiritual combat: if we see our demons (Ares) before they see within us the way to get us to commit sin, then we win and they can't come back and destroy us (unless we invite them back in); when Ares is nearly dead in the art exhibit, and she signs, "See you," Wick knows she's finished, but Ares thinks there is still a chance she can "haunt" Wick, but Wick knows he has won the fight. It's important that, when Ares and Wick fight in the exhibit, Wick first breaks Ares' right arm (a symbol of strength, so that what Ares symbolizes to Wick, can't be used against him) and then, he stabs her in the left hand with her own knife (it's not quite a knife but it has a blade on it) and then uses that to stab her and finish her off. This is the utter defeat of Wick's demons so that he's free to kill Santino, namely, all the "weapons" which Wick's interior processes are throwing at him as reasons not to kill Santino, are actually turned back on the demon to defeat the demon with the demon's own weapons. Part of this "arsenal of weapons" is what Santino tells Wick in the exhibit: you like the killing, you like the revenge, you are never going to stop. Those "thoughts" and "temptations" to think that is what "Ares" is all about, the physical "reality" of what Santino accuses Wick of, and which Wick defeats: no, I'm not like that, I'm in this because you dragged me into it, Santaino, and now, with your death, I'll become stronger than ever because of the consequences I'm strong enough to accept.When Wick goes to the Continental to kill Santino, Wick doesn't say, Is Santino here? He doesn't just go into the lounge, knowing he'll be there, he tells Charon, "I'm here to see Santino D'antonio." Just as Ares keeps saying she "sees" Wick, it's because Wick "sees" Santino for what he really is: the power-hungry socialist who is going to drive everyone else out of business, which is what he threatens Winston with when Winston refuses to revoke Wick's membership, and Santino says, enjoy your kingdom while it's still yours, because Santino plans on taking it for himself now that he's at the High Table, and that means Santino will grant membership only to those he likes. But, importantly, Wick also uses Ares' gun to kill Santino with, and uses the silencer--because Ares herself was "silent"--demonstrating that Ares is, in fact, the symbol of Wick's inner-struggle to decide to kill Santino. But, and this is important, when Wick lays the gun upon the table with what was Santino's last meal, and Wick says, "Finished it," we know it's finished because this "course" was started in Rome, and that scene was the dessert. We know names are important in this narrative universe, and we know that the name "John" means God has been gracious or, more often, favored by God. We also know that a "wick" is like a fuse: there is the "wick" on a stick of dynamite, for example, or there is also a wick on a lamp (like the old fashioned gas lamps) which can be lit and give off light. 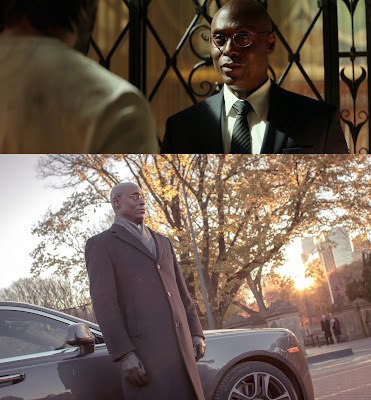 We might assume that the "wick" in John Wick denotes a short fuse and he has a bad temper, but at the start of the film, Abram enumerates for us that John Wick is focused, committed and achieves his ends through sheer will power, so there is nothing about a bad temper, and stealing the guy's car and killing his puppy, then blowing up his house, all after he has just buried this wife, is really a lot for a person to take, so that leads us with the interpretation of "wick" as a light,... There is, however, still a problem. IF I was going to complain about anything in JWC2, it would be this statue, Hercules and Lichas by Canova, 1795, marble. 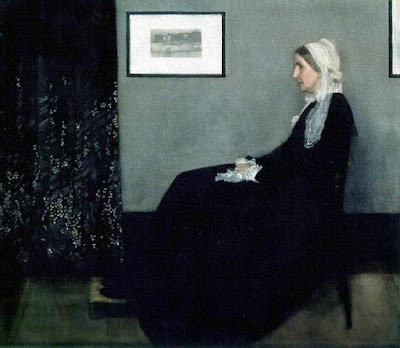 My background is in Art History, so I keenly pay attention to any and all art works when they are introduced into films, knowing they offer a special vein of commentary and beg to be decoded. It makes perfect sense that Hercules would appear as a metaphor of John Wick, and the "impossible task" which was set before Wick to complete before his original boss would let him out so he could safely marry Helen (the events prior to John Wick, but which we hear about in both films). At this point, we don't know the details of the "impossible task," but we do know that Wick went to Santino (probably as we see Wick going to the shops in Rome before he "visits" Gianna) to help him complete said "impossible task." This lines up nicely with Hercules and the 12 deeds which Hercules had to complete in order to gain immortality: as we see the state of Hercules above, lined on both sides by the gods and goddesses of Olympus looking upon Hercules, we can see Wick being in a similar position of being put to the test by Winston so Wick can gain immortality, both in word (the stories told about him) and for his immortal soul to attain heaven. 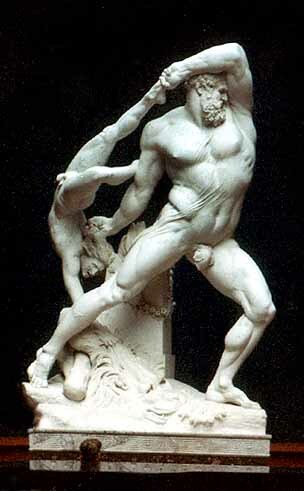 There is a plethora of art works regarding Hercules and his deeds, but it's this one, with his servant Lichas, that bothers me because I can't make it fit. The story of the death of Lichas goes, that Hercules' wife, Deianira, was jealous of the beautiful young Iole whom Hercules had claimed to be a wife of his; the dying centaur, Nessus, gave Deianira a shirt poisoned with his own blood, and told Deinaira it was a love charm and would make Hercules fall in love with her again; in her jealousy of Iole, Deinaria gave the shirt to her servant Lichas to give to Hercules; when Hercules put it on, he began dying, and threw Lichas into the sea as a punishment, thinking it was Lichas who wanted to kill him. Again, there are plenty of excellent sculptures from which the film makers could have chosen Hercules rather than this sad state at the moment of his death. We could, however, interpret Santino to be Hercules, because the statue we see is in his museum, and Santino tries to kill Wick as Hercules kills Lichas, but do we really want to compare the "little saint" Santino to the great hero Hercules? We could say that Santino is actually Deinaria, jealous of his sister Gianna, and Santino sends Wick to kill Gianna as Deinaria sent the poisoned shirt with Lichas. Since Gianna, and her protector Cassian, aren't able to avenge Gianna's death, this doesn't really fit. So, this is why this work of art is my only complaint about the film, but there are two possibilities. First, we are only supposed to read the art at face value: Wick as Hercules, hurling all the other assassins into the face of death as they attempt to destroy him (rather than the helpless male figure being that of Lichas, it's supposed to just be a person trying to kill the hero). What substantiates this possibility is the painting of the Civil War scene which Santino gazes upon in the museum when Wick comes to get the assignment which will release him from the marker Santino holds against Wick. We don't know what Civil War scene that is, only that it is, indeed, from the American Civil War, and that the painting can be easily applied to both the Civil War between Santino and Gianna because she is at the High Table and not Santino, and to the Civil War which Santino wishes to unleash in New York by taking control of it for himself. The second possibility is that we aren't meant to understand the significance of the Hercules sculpture just yet, that it will still be revealed in the next film, just as we don't know what that impossible task was which Wick was sent upon to complete so long ago. If I HAD TO MAKE A CALL, I would say it's probably the first possibility: we are just meant to understand the statue of Hercules on a surface level, with Wick as Hercules, hurling all the other assassins coming for him into the abyss of death. We know John Wick has the tattoo of the howling wolf on his right shoulder, and then there is the pitbull who "doesn't have a name yet." That's rather ominous. Even though he's been a "good dog," throughout John Wick 2, we know (again) that names are important in the John Wick universe, so when the dog does get a name, it's probably going to be terrifying, yet philosophical and metaphysical, and a direct result of what Wick is going through at the time (please see caption below for more). 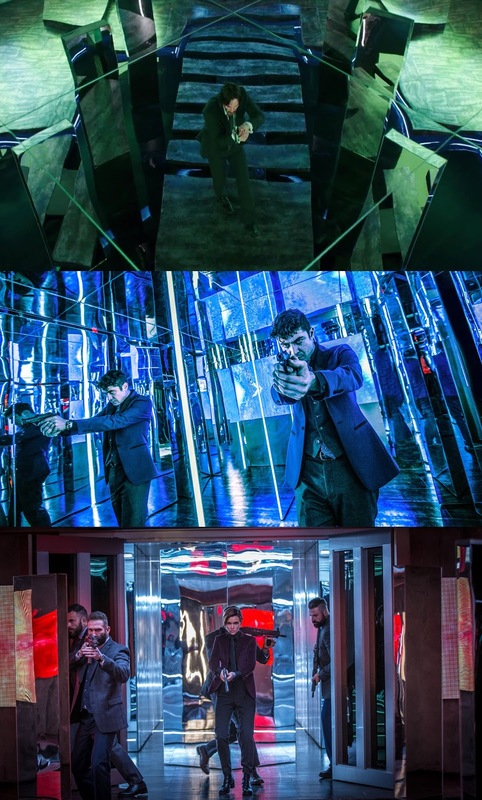 The scene at the top image is from John Wick, and the bottom image from Chapter 2. The theme of the dog isn't just important because Helen chose to leave Daisy, the beagle, to Wick after her death, and because Wick gets a new Pit Bull at the end of the film, but because Wick has the tattoo of the howling wolf-dog on his right shoulder. Typically, dogs symbolize loyalty, and when they are included in certain situations, they can symbolize infidelity of one of the partners. There is absolutely no reason to deduce that, given Helen's and Wick's relationship, rather, "Daisy" is a sign of their faithfulness to each other that has now been broken due to circumstances beyond their control, as discussed above. That is the typical reading of a dog, symbolically, however, given that these two dogs play such an important role in Wick's life, and the story, and the howling wolf on Wick's back, there is a deeper meaning we should mine, specifically, that Helen likely knew about the "howling wolf" within Wick (the wild part of his appetites which Santino says is addicted to the blood shed and revenge during Wick's time in the Reflections Of the Soul exhibit trying to kill Santino) and, in giving Wick a sweet beagle, hoped Daisy would suppress the wolf within Wick so Wick wouldn't become reckless in his rage about losing Helen to death. Obviously, that didn't work. Enter the Pit Bull with no name. This detail is imperative because it has yet to take form, i.e., the Pit Bull hasn't been released yet, and when it is, everyone will know. Given how Chapter 2 ends, we are going to see it in Chapter 3. The unnamed Pit Bull, then, is like the weapons case Wick buried in his basement, "Out of sight, out of mind, but not out of Wick's being," meaning, he can use it whenever he needs it,and Wick is going to use the energy, strength and skill the Pit Bull symbolizes. We can also say that Daisy the beagle symbolized a kind of "domesticity" which Helen believed Wick to have achieved, and he certainly did, but, like Daisy herself, it was short-lived; the Pit Bull is a kind of uneasy cross between the domestic beagle and the wild, howling wolf on Wick's back. On a different note, the Pit Bull is important because it's on Wick's journey with him. In the image at the bottom of the two images above (the one of Wick and the dog crossing the Bridge) this scene mirrors the scene of Santino knocking on Wick's door and them walking down that long hallway in Wick's house before Santino blows it up. Why? A hallway, as described above in that caption, is like a bridge and a bridge like a hallway: they are connectors, connecting two different states of being. This scene reminds us of Spectre, when Blofeld (Christoph Waltz) leads Bond and Madeline down a long hallway of windows in Blofeld's desert headquarters and, at the end of this "journey," asks Bond, "So James, why did you come?" and Bond replies, "I came here to kill you." In this way, a bridge or hallway becomes like a birth canal (especially when there are windows/mirrors/water involved in the sequence as well) because it's the "birthing" of a purpose, intent or understanding which is going to alter that character in a significant manner. In the hallway scenes in both JWC2 and Spectre, the halls are lined with windows symbolizing the reflection taking place on a meditative level within the characters; in the bridge scene above, even though we don't see it, we know there is water beneath the bridge, and water is the symbol of the first stage of reflection within Wick; with the water, however, there is also the element of "redemption" because it is a sacramental and the film is full of religious symbols. 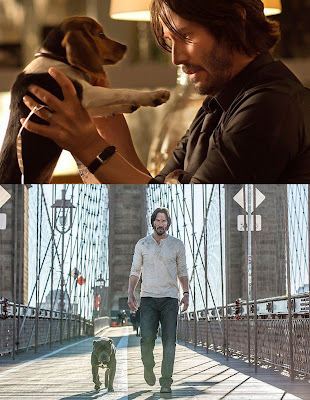 I hope I don't lose you in saying this, but (in a highly abstract way) the walk which John Wick makes from his house that has burned down, to the Continental Hotel, is a metaphor of the entire film, i.e., the "journey" Wick takes on foot symbolizes the journey Wick's soul takes in the events of "finishing it" with Santino. The theme of the journey is imperative because it signifies design, purpose and providence, namely, that the journey serves a purpose and is in no way arbitrary or useless, rather, it's a most necessary part of life and the cornerstone of the "reflection on the soul," for without this journey, how could one know the soul to begin with in order to reflect upon it at greater depth? By now, we should know the answer to the question about the John Wick Chapter 2 body count: why are there so many dead bodies at the end of a John Wick film, and why does it matter? For those who are materialists and don't believe in the spiritual life (and trust, me, I've argued with them before on this very topic), all they see are dead bodies, not realizing that those aren't "dead bodies" of "real people," rather, the metaphors of spiritual warfare and trophies of eternal combat. John Wick's body count, then, is not only a sign of his masculinity in that he's been able to master himself with his "focus, commitment and will," but he has also built up his soul to be the dwelling place of the ultimate man, Jesus Christ. Without the example of Christ, there is no Love, and we do not know how to better ourselves or overcome the demons enslaving us, which is why we see the banner, "Jesus Saves" in the soup kitchen; then the question becomes, are we willing to be saved? Charon is a minor character, however, one exceedingly likeable and trustworthy; what is his role in the film? Exactly that of his mythological name of "Charon": the ferryman. He runs the hotel because, just as a hotel is a temporary dwelling and not a permanent home for the soul, so, too, is earth a temporary dwelling and not our permanent home. When Charon arrives at Wick's burnt-down home, Charon "ferries" Wick to the next destination of Wick's journey, the final test of Wick's apotheosis to become the "man, myth and legend" everyone all ready believes him to be. Rather than Wick's costume in this scene telling us what is happening to Wick, Charon's costume tells us: he wears gray, which denotes the colors of both penance and the pilgrim, the soul in a state of remorse and conversion away from the lesser goods to the greater goods, and since Charon the ferryman is the vehicle for Wick to arrive from one place to the other, it befits the scene that Charon's costuming would denote for us the point of development Wick faces in this scene. Charon saying "Good-bye, Mr. Wick," is rather ominous, isn't it? Wick believes so, too, when he asks Winston, "Why am I not dead yet?" We know from John Wick that Wick should be immediately terminated for violating the conditions of the Continental Hotel as Ms Perkins (Adrianne Palicki) did in the first film when she went after Wick in his hotel room. What I think Charon's character conveys in this scene, and with that specific dialogue, however, is that the same John Wick will never be seen again; there will be another meeting, but John Wick will not be John Wick, he will be far more than he can possible imagine, in the minds of everyone as well as within his soul, so it's the saying good-bye to one man so the other man can be born. In conclusion, JWC2 is a dense film, filled with the golden nuggets of wisdom that only those who have trudged the depths of hell can possibly begin to acquire for themselves, and disperse for others; in other words, the film is by far smarter than I am, and if there are "obvious" things you feel I missed, dear reader, it's because I did, in fact, miss them (and because I am posting this before I am actually finished writing it :o). This is one we will be able to go back and watch countless times, and still be "catching something new" with each viewing. Enjoy, because films of this quality don't come around often (this post built upon the first film John Wick, and you can read that post here at Specialized Waste Disposal: John Wick). And, at this link here, you can keep up-to-date about John Wick Chapter 3 and his origin story developing via a comic book, plus a TV series planned on the adventures in the Continental Hotel.